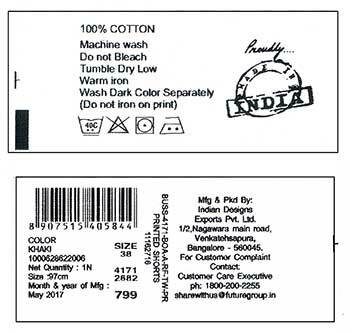 We supply printed clothing labels for over 33 years in various and interesting substrates like satin, taffeta, tyvek, cotton, polyester, spun polyester and broadloom woven substrates. 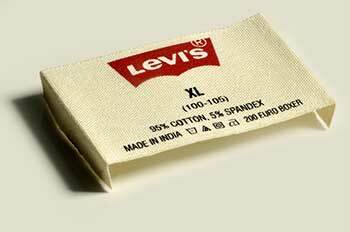 Over 3 decades of experience in making fabric printed label are manufactured and supplied at Mumbai, India. We have an in-house manufacturing facility for woven substrates and this sets us apart from others in the printed labels industry. Printed labels are made on a variety of materials and are a great choice when you want a label with an intricate design. You can achieve great detail with printed labels and you have greater freedom with the information that you can include on them. One should consider the application of the label while choosing the type of printed label. Printed labels are extremely cost effective as compared to a woven label. We have manufacturing capabilities for output volume runs from a minimum 3000 labels up to 2 million labels per day.. Logistics expertise- With the complex breakups of the labels, we have mastered supplying to several factories of a brand. We offer front and reverse printing. Any size is possible, ultrasonic cutting ensures a super soft finish even on the edge. Label finishes include: Roll form, ultrasonic cut and seal, cut & end fold, cut & centre fold, booklet fold, flag label, cut & mitre fold. 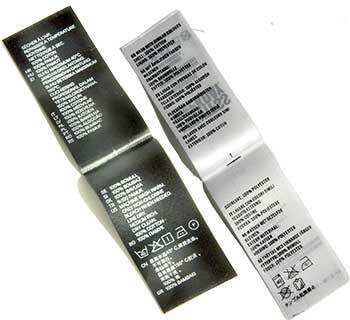 Taffeta printed labels are typically used as care or content labels. They are only offered in black on white and are limited in the sizes that are offered. If high clarity of your design is important, then you will want to consider printed satin. Satin labels are very soft with a shiny finish. A satin label could have a woven edge or slit edge with various colours to offer. 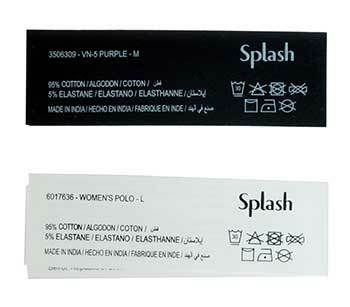 The most preferred satin printed labels are white or black. We are experts in manufacturing fabric self-adhesive or iron-on labels with consecutive numbering. 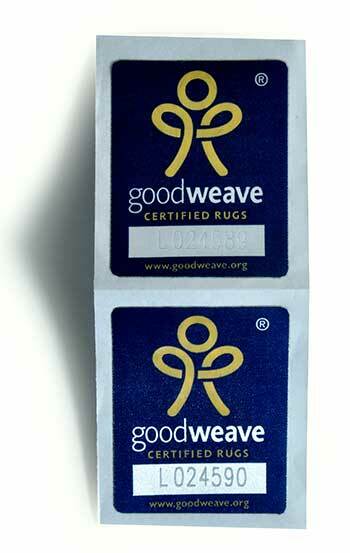 These labels are recommended for carpets and rugs. 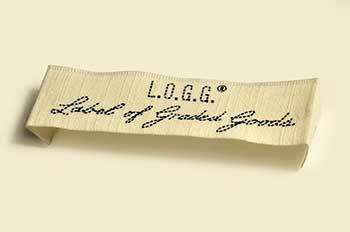 In order to completely remove a tag from a garment, the garment must have a tear-away label. Some tear away printed labels are perforated and which pulls right out easily. It is a polyester woven tape with print on it. If you want a label with lots of color and detail, screen printed, polyester substrate printed label works the best. 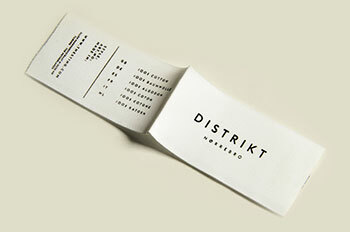 Slub substrate printed labels have the most vintage look as it is created by using uneven yarn. The slub substrate has a textured surface for printing. With the right design, this effect can be very attractive and can add a lot of dimension to your print. 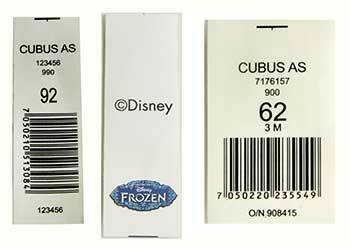 We offer variable data printing on fabric labels. 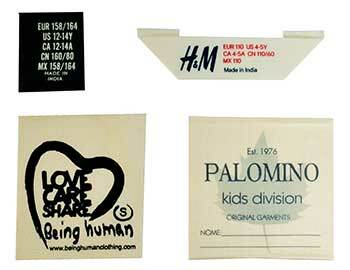 Fabric labels with variable data are widely used in the clothing and home textiles industries. You can combine your brand label or care label with different sizes, consecutive numbers or barcodes. The substrate for this label is a broadloom woven tape in fine damask and then printing is done. The sharpness of the print is evident because of the fine damask background. Q. What is better- woven label or fabric printed label ? Q. What is a substrate ? Q. What are Pantone shades ? Q. What are the label printing processes ? The substrate can be printed by off-set, flexography, thermal or screen printing processes. Q. Should a care label be a woven label or a fabric printed label ? Q. Can a fabric printed label be printed on the reverse too ? Q. How many colours can you print on a garment label ? Q. How do you count the labels ? ? Q. Can you print on a black substrate ? Q. Which substrates does Arrow use ? Q. We certainly do not want our labels to bleed/fade. How do you ensure this ? Q. Can you match an exact shade on a printed label ? Q. What is an ultrasonic cut label ? Satin printed labels with twin printing are generally stitched on one side & the label is made to hang. (It is not folded). If the label touches the skin, the ultrasonic "cut" eliminates any itching. Q. Explain the various ways in which you can fold a garment label ?